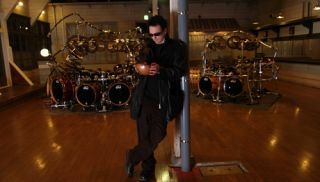 Drum hero Terry Bozzio has a special London show coming up this month, and we have two pairs of tickets to give away. Bozzio, renowned for his huge kits and jaw-dropping displays with the likes of Frank Zappa and Missing Persons, will perform at The Garage in London on 10 November. The show starts at 1PM and is open to those aged 14 and over. Tickets are available for £22.50 plus fees from here. But, we have two pairs to give away. To be in with a chance of winning just head here and answer a simple question. Competition closes Tuesday 6 November 2012.